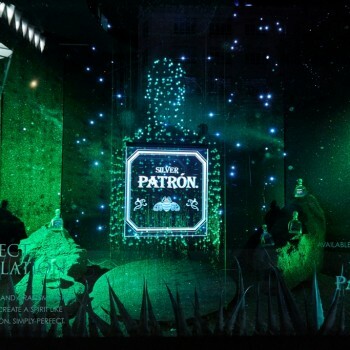 Patrón Tequila has opened a 1,000-lightbulb Christmas window display in Selfridges, London. The green lights form the shape of a Tequila bottle and twinkle on and off to look like stars. “The installation reflects Patrón’s commitment to perfection and celebrates our iconic bottle,” said Matthew Sykes, director of marketing at Patrón Spirits International. The display is called “A Perfect Constellation”, and is designed to fit with Selfridges’ 2015 Christmas star theme. In addition to the instillation, Patrón Tequila will also be offering samples on Selfridges’ sales floor. “Patrón and Selfridges are a match made in heaven,” said Martin Flavin, creative director at design agency Five by Five. Patrón Tequila had a window display at the same location last year. That display featured cast models of 60 hands, the number involved in making each bottle of Patrón Tequila. Patrón Tequila is still produced exclusively in the Highlands of Jalisco in Mexico.